How good is your employee benefits programme? What are other employers doing and should you be following their lead? Whether enhancing health or financial wellbeing incentives, or standardising your benefits offer across the workforce, you need to understand the trends in the wider workplace. 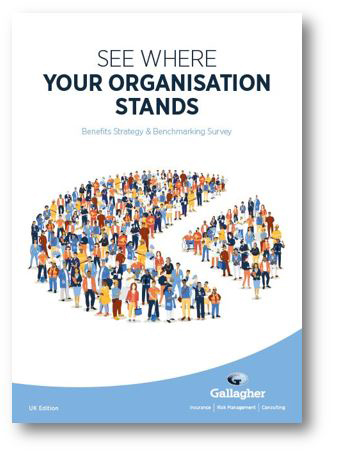 Gallagher’s Benefits Strategy & Benchmarking Survey can help guide better strategy and organisational outcomes through better benchmarking. The survey includes responses from 172 UK employers and valuable insights on the trends currently driving organisational wellbeing. Download the Benefits Strategy & Benchmarking Survey to see where your organisation stands — and learn how to gain a sustainable competitive advantage as a workplace that simply works better.